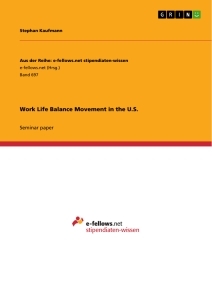 Typing in ‘Work Life Balance Movement in the US’ in various search engines does not deliver a very satisfying result. Google, Yahoo and Bing are totally overloaded with information like newspaper articles, books and Human Resource consulting firms trying to sell their idea of Work Life Balance, Tips & Tricks and of course their best and only way to achieve it. Where does all that content come from and which is right? Is there any right or wrong? Is Work Life Balance a black or white topic? Is it something where only one opinion is right and all others are useless and doomed to failure? Hundreds of studies within the last couple of years and an unknown vast mass of self-declared experts suggest that Work Life Balance is a topic of fashion. Like burnout – a huge bubble ready to burst and ready to be used as excuse for almost everything. Used as an excuse for failure in business, family and friends. Obvious it is a topic that attracts lots of attention in both the employees’ and employers’ mind. What is the reason for that? Work Life Balance or better Work and Life in Balance transports a very promising message to its addressee. Again it sounds like a big purple soap bubble filled with fun and joy, filled with cotton candy and little ponies. But what do employees experience in real Life? And who is responsible for that? Out of the information overload delivered by the World Wide Web and caused by its users, the people springs up a flood of questions dealing with that topic. This paper is not meant to deliver an answer to all these questions. Neither is it designed to create another vague theory of reaching the goal Work and Life in Balance. Rather it aims to set the Work Life Balance especially in the U.S. in context to the historical background of the United States of America. It is meant to shed some light on aspects which have been overseen or not addressed yet. Furthermore it gives a brief overview of incentive packages, benefit-programs, flexi-time and home office solutions and provides a constructive discussion about the values behind this movement. Moreover the investigation of the American role model may provide Germany with terrific results regarding how to use all these perks to increase employee satisfaction and correlated through that sales and profit. 11 out of 1400 companies make the leap, while others do not. That is the result of “a five-year research effort, a journey to explore the inner workings of good to great” embarked by Jim Collins and his research team. In his book ‘Good to Great’ he unveils six components which are necessary to convert from a good company to a great one. The buildup phase is characterized by three key points. Step one is called ‘Level 5 Executive’ and describes the type of leadership a company needs in order to become a great company. The profile of this desired leader can be described as an incarnation of several features including personal humility and professional will. After a company make sure that it has the loyalty of this leader it moves on the second level. ‘First Who… Then What’ elaborates on the order in which decisions are made. Regarding the title of this phase it is obvious to tell that in the beginning attention should be drawn to the recruitment of the right people. This step is about human capital, about the recruitment skills of a company’s Human Resource Department and the power and efficiency of the recruitment process. One idea integrated in this step and worth highlighting is the recruitment of the right people. Nor is it helpful to have a great bookkeeper as Head of Sales neither an outstanding salesman as facility manager. Besides the recruitment of the right people it is crucial to coordinate the process of defining the company’s target after the hiring process is completed and you got the right people in the right position. Immediately the company strives to use the human capital in order to define the right target and direction. After the phase of hiring and positioning is completed it is recommended to move forward to the final level of the buildup process, the so called ‘Confront the Brutal Facts’ level. Instead of distorting facts this evolution level is dominated by honesty and integrity. Development from a good company to a great one does not stop at hiring the right employees and setting the right target but facing the inconvenient challenges of the market, the competitors and shareholders. Only the acceptance and appreciation of dares allow a tremendous shift in corporate organization strategy and mentality. When the buildup procedure is completed it is followed by the three levels of the breakthrough. For this paper the focus lies on the first three steps in combination with other implications. Therefore these components play a lesser role. No doubt also the final three steps would be totally worth elaborating on but ‘Good to Great’ delivers one extraordinary message in the first place: The people matter. Employer Branding Strategie. Identifikation von Entscheidungskriterien zur Arbeitgeberwahl.